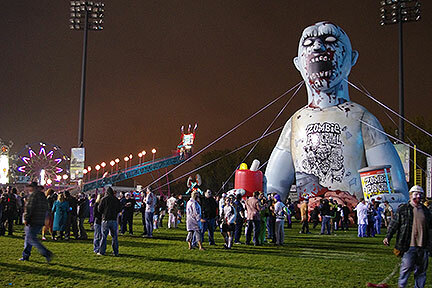 As an inflatable manufacturer with high quality standards, we pulled out all the stops to incorporate every detail that makes for a good zombie. (Surprised that we knew about such things?) Distant eyes… a face covered in blood and gore… and guts hanging out for all to see top the list of instant zombie identifiers. Top that off with a wardrobe consisting of an official Zombie Pub Crawl T-shirt and a cold one for each hand, and Phil became the poster child (literally) for zombies everywhere. And the public response? You can well imagine that people took notice, including Minneapolis Mayor R.T. Rybak who tweeted a picture of Phil to all of his followers. Now that's publicity you couldn't buy for all the money in the world!